In 2002 I switched from my city job to running a business on Southend Seafront. My family had previously run businesses on the seafront in the late 70’s so the concept was not entirely new to me. Almost 17 years on, I’m still running my business. During this time I have chaired the Seafront Traders Association and had a stint as a Director of the Southend BID. I feel passionately about the Seafront and believe it makes a considerable contribution to Southend’s economy. The council’s proposed restaurant/cinema development on Seaway car park represents a critical threat to tourism in Southend, so when invited by the Oracle to write an article for them I felt compelled to lay out the truth about this development. Located behind the Seafront, the strategic importance of Seaway car park’s 661 spaces is vital to the town’s tourism economy. The A127 and A13 converge at Victoria Circus, following Queensway through the underpass takes visitors directly to the entrance of Seaway where they can park easily and conveniently. Today 85% of Southend’s tourists arrive by car. 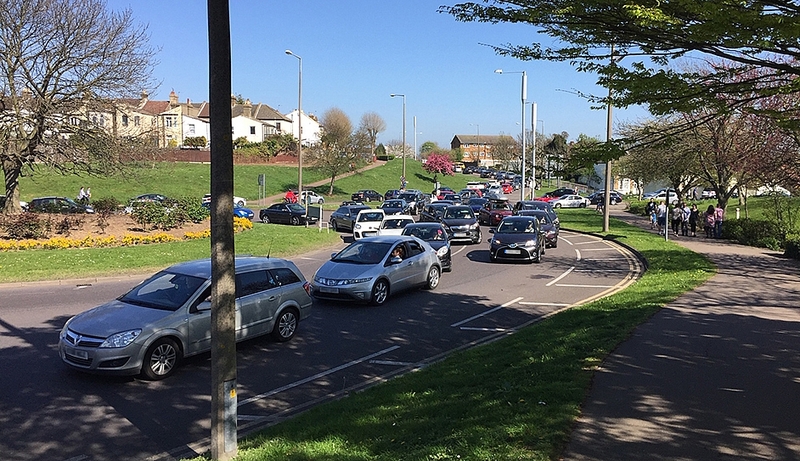 As residents, you know when the sun is out there is a major shortage of car parking spaces around the Seafront area. The lack of parking capacity creates major congestion as cars circle round and around hunting for non existent spaces. Seaway is full by 1pm on busy days, the traffic queues up, the roundabout grinds to a halt and congestion builds across the whole town and down the A127 past Basildon. Resultant pollution and increased journey times are detrimental to the town’s economy. Local residents avoid the Seafront and High St when it’s hot for fear of getting stuck in traffic. Visitors choose not to return as it can take hours to get into the town and find a parking space. More parking spaces are desperately needed to cater for population growth and to allow tourism and our economy to grow. A viable development on Seaway must satisfy the seafront’s parking needs (661 spaces), as well as ‘consuming its own smoke’ in terms of providing spaces needed for the demand created by the development itself. In short, anything less than 1000 spaces would cause congestion and gridlock on sunny days damaging the town and it’s economy. SBC agreed to and signed a contract with the developer to include a minimum of only 480 spaces in the development, resulting devastatingly in a loss of 181 spaces. Call it commercial naivety or plain stupidity but that was what was agreed and it falls far short of the 1000 spaces needed. The High St will not escape the ill effects of the development. The seafront drives footfall to the shops so anything that hurts the seafront will in turn affect High St footfall. The ‘restaurant quarter’ and Odeon at the north of the town will also suffer. The sector is struggling nationally, the likes of Prezzo, Jamie Oliver, Strada and Gourmet Burger all in trouble. Demand is simply not there for more eateries in the town. Restaurants will close, some will relocate to the new development. Can the Odeon survive? Jobs will go, businesses close and SBC will lose out on rates, as charity shops fill the voids. Frankie & Benny’s is the first to close from the top of the town, having signed up to Seaway. Squatters and other non desirables have already moved in! The town’s largest car park, Seaway, is a significant revenue generator and asset which in theory is owned by the residents of Southend. Thus I believe the financial terms of this deal should be in the public domain. SBC thinks otherwise, having kept these details hidden from all but a handful of officers and councillors. Why? Instead of putting the site out to tender on the open market, SBC sold the Seaway lease privately to an out of town developer for the premium of £1. Three years on SBC bought the Gas Works site (half the size of Seaway) to replace the car parking that would be lost to the Seaway development for £9.5mn! Under the agreement SBC’s rent will be £282k p/a for the Seaway site (comprising the car park, the Rossi factory and the neighbouring house in Herbert Grove). However the car park took £607k this year, the Rossi factory and house have a market rent value of £67k and 13kp/a. This puts the site’s current gross revenue at £687k p/a. The tax payer will be considerably out of pocket if the development comes to fruition. SBC’s claim they are seeking a ‘more stable’ income from rent and rates as opposed to parking revenue pales into insignificance as revenue from Seaway has increased by a staggering 75% in the last 7 years. Last time I looked commercial rents have plummeted and the chancellor had just cut retail business rates by a third. SBC’s claims fail to account for the displacement of jobs and rates as businesses close in the top of the town due to the new development. In November 2014 the then new leader of the council, cllr Ron Woodley was advised by senior council officers to sign this agreement. The 4 year deal was signed, with an expiry date of 10th Dec 2018. Turnstone Estates has failed to achieve planning permission for the development within this timeframe, and thus SBC can walk away from this deal after 10Dec18. I met Ron Woodley for a coffee last week, he agreed that after the 10th Dec deadline, SBC should put the whole development under full review. Why not ask your local councillors if they also support SBC going back to the drawing board on the Seaway development? When I red the article (ad?) by Mr. Philip Miller about SBC not being corrupt, I laughed. It was a sort of nervous, I-want-to-kill-somebody laugh – probably because, like him, I've been observing the stupid and corrupt things, that the SBC has been doing for decades! And frankly, I've had enough! I think, that the only way we are going to improve the way and the what is being done in this town, is to get rid off the lot of them! After all, most of them should probably be locked up – in a jail or in an asylum – and should there be any "innocents", they obviously have either no clue or no back-bone. Will the public be advised if the Council will ‘walk away’ from the proposed development once the 10 December deadline has passed?